Penguin sits at the head of his table surrounded by a rowdy group of criminals. They appear to be representatives from the different gangs of the Gotham criminal underground. Cobblepot can’t believe that nobody can reveal to him who was the mastermind behind the Arkham Asylum breakout. The late Jerome Valeska’s reign of terror seems to have affected the criminals as well. He tells them that unity needs to be restored. He was happy with the way things were before Valeska’s uprising and fully intends on getting things back to normal. Tabitha enters the room and quietly watches as Cobblepot ends his speech and dismiss all his underlings. She has a message for Oswald; her brother, Theo Galavan, would like to meet with him alone. 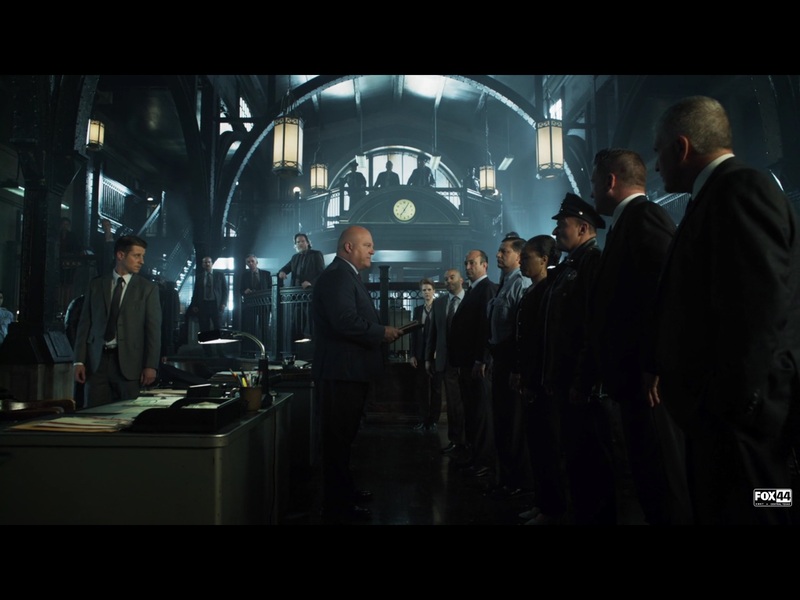 The cops at the GCPD are having a hard time adjusting to Jim Gordon as the de facto leader of the police force. The shouting match between Gordon and one of his unhappy colleagues is interrupted by the sound of a wooden chair being smashed on the ground by an unknown person who had been watching just a few feet away. He introduces himself as Captain Nathaniel Barnes and he quickly demonstrates that he means business. He’s ashamed that the Gotham City Police Department allowed Jerome Valeska to almost effortlessly walk into the station and kill 9 of their fellow cops as well as Commissioner Essen. He is ashamed of the police department and some of his officers as individuals. The individual police officers he is referring to are all connected to criminal activity. Within seconds, he stuns everybody by firing all the crooked cops and promising that any employee of the GCPD that breaks the law will be fired and thrown in jail. The remaining cops with jobs are dismissed with the exception of Gordon who Barnes summons into his office. Barnes and Gordon hit it off immediately. Jim is honored when Captain Barnes promotes him to 2nd in Command. The Captain says he has big plans to fix the Gotham City Police Department. Theo Galavan is home watching the news. The reporter points out that with the recent murder of the deputy mayor, there is a need for leadership in the city of Gotham. Janice Caulfield and Randall Hobbs have thrown their hats in the ring. According to the reporter, the public seems to want Theo himself to run for mayor even though he has not officially announced any interest in the position. Theo turns off the TV to address Oswald and Tabitha who have recently entered the room. Penguin seems genuinely suspicious of Galavan and quickly surmises that he was the person who orchestrated the breakout at Arkham. Tabitha lets Penguin know that unlike Theo, she is not impressed with his crime empire. After all, she has no clue that Cobblepot was able to work his way up from his entry-level position as Fishy Moony’s umbrella holder to the leader of Gotham’s criminal community. His resume is impeccable. Theo needs Penguin to lend him a hand. He wants Cobblepot to take out the mayoral candidates as well as fake an attempt to take out Theo. This plan should craft a hero narrative for Theo as well as avert any suspicion that he could be involved. Penguin politely declines, but Theo has a contingency plan for just an occasion. He reveals that Cobblepot’s mother Gertrude is being held captive and the only way to ensure her safe release is for Penguin to help him with his plan. Doctor Leslie Thompkins, the GCPD’s Medical Examiner, is fast asleep when she is abruptly awoken by a phone call from Captain Barnes. He happily tells her that he plans to provide many more dead criminals for her to examine. Wait… What? Then the Captain asks if he could speak with Jim Gordon. Leslie hands the phone over to her boyfriend, Jim who has been lying next to her with a confused look on his face. The Captain tells Jim to meet him at the Police Academy. While Barnes seems very excited to get to work, Jim just wants to know how the Captain knew he would be at Thompkins’s apartment. According to Barnes, everyone knows Gordon is “bangin’ the M.E.”. Who knew the police department could be so messy? Gordon and Barnes arrive at the police academy. Their goal is to recruit some of the graduates who show the most promise before they have a chance to get corrupted by the Gotham streets. They select 4 young officers who exemplify the things both men find admirable and name them Unit Alpha of the Gotham City Police Department Strikeforce. Theo stands atop the steps of city hall as he’s presented with the city of Gotham’s Medal of Valor and Bravery. One of the many reporters asks Theo why exactly he hasn’t decided to run for Mayor. His answer is interrupted by the sound of bullets as a car goes speeding by with a masked shooter firing off bullets in the direction of Galavan. After the bogus drive-by, Theo stands up and announces that he does intend to run for Mayor. The crowd cheers at the phony act of bravery and Theo looks thoroughly pleased. Later, Penguin and Butch pay a visit to the base of the campaign for the mayoral candidate, Janice Caulfield. Caulfield pleads for her life but to no avail. Butch restrains the witnesses while Penguin stabs Janice repeatedly, killing her in cold blood. Amongst a crowd of adolescents, Bruce Wayne timidly exits the doors of. His butler Alfred waits with the car a pretty good distance from the school grounds. He is startled by the sound of Selina Kyle climbing atop the wall just behind him. Selina jumps off the wall to have a conversation with Alfred, but he is not pleased to see her. Alfred meets Selina with a haymaker of a slap to the face. Selina looks almost as shocked as I was. Alfred tells her that he knows that Selina killed his ex-military buddy Reggie and he doesn’t want her hanging out with Bruce anymore. With her face and ego bruised, Selina disappears back over the wall right as Bruce arrives at the vehicle. Alfred offers to pull the car around to the front of the school from now on, but Bruce isn’t fond of that idea. He doesn’t want everyone at the school to know that he has a butler. We find out during the conversation that Bruce has dinner reservations at a fancy restaurant with Theo Galavan. Bruce feels like buying Theo dinner is the least he could do to repay him for saving his life. As Bruce opens the door to the backseat of the car Alfred stops him and hands him some workout clothes. He promised to train Bruce to protect himself and apparently that starts with a 6-mile run from school to Wayne Manor. Edward Nygma is once again at the police station trying to muster up the courage to ask out his colleague, Kristen Kringle. At the urging of his psycho alter ego/subconscious he finally decides to go for it. Ed walks right up and invites her to dinner at “Chez Moi.” Pleasantly surprised, Kristen agrees to the date and without another word, Nygma turns and leaves like a boss. Elsewhere in the police department, Captain Barnes is giving the Strike Force a pep talk when a detective approaches and delivers the news about the murder of Janice Caulfield. Jim and Harvey arrive at the Caulfield campaign headquarters to try to get the witnesses to reveal any information they might know. The witnesses know that Penguin and Butch have all their names and addresses. They are very worried about retaliation. After some prodding from Gordon, one witness is willing to give a description of the killer. Jim looks horrified when it dawns on him that the person responsible for this murder and the attempt to kill Theo Galavan is none other than Oswald Cobblepot. Theo and Bruce meet for dinner. Alfred excuses himself so that the two could have a private conversation. Bruce tells Galavan that he was eager to meet with him so that he could thank him for saving his life. Theo was also looking forward to speaking with Bruce. He tells Bruce that he is amazed that the police and Wayne Enterprises have not been able to make progress in solving the murder of Bruce’s parents. Bruce doesn’t seem very interested in having that conversation, especially when he is distracted by the blonde teenage girl frolicking outside the restaurant window. The two go outside and Theo introduces the young lady to Bruce as his ward, Silver. Theo reveals that Silver will be attending school with Bruce in the new future. Bruce is looking forward to it. Kristen knocks on the door of Chez Moi aka Edward Nygma’s apartment. She was under the impression that he wanted to take her to a restaurant, but it was his plan all along to cook for her in his home. Edward, you sly dog! I will admit it was a pretty smooth move on his part; creepy but smooth nonetheless. Victor Zsasz (I still struggle to pronounce this name), is busy attempting to take murder the other mayoral candidate, Randall Hobbs. He shows up to the boardroom where Hobbs and his colleagues were meeting and opens fire. Hobbs manages to escape outside where the GCPD Strike Force along with Gordon and Bullock is waiting. Once again there’s a look of terror on Gordon’s face when he realizes that Penguin is involved. Shots are fired and Victor Zsasz escapes into the night. Back at Chez Moi, Ed and Kristen are getting acquainted. It might be the wine talking, but Kristen seems genuinely pleased with how the night is going. She finds it very funny how she was once so mean to Edward and she even accused him of being the actual author Tom Dougherty’s (her abusive ex-boyfriend) goodbye note. Edward accidentally lets it slip that he’s happy the abusive detective is dead. Whoops! Big mistake. He seemed to have forgotten that Kristen has no clue that the detective was killed. She thinks he only left town. Ed tries to cover up his mistake but by this time it’s gotten too awkward. Kristen excuses herself to go to the restroom, leaving Ed sitting at the dining room table. Nygma’s evil subconscious berates him for ruining the moment. Kristen notices something is wrong and confronts Ed about the things she can hear him saying to himself. Edward comes clean and reveals that sometimes he talks to himself to keep from being such a klutz. Miraculously, Kristen finds this very endearing and the two share an intimate moment. Jim Gordon confronts Cobblepot about his involvement in the attacks on the mayoral candidates. Cobblepot doesn’t want to be bothered, but Jim persists. Jim tells him that the GCPD is under new leadership and will come after him if they find out he is behind the attacks. Penguin quickly extinguishes these threats, reminding Jim that he knows the detective gunned down Ogden Barker and could reveal that information at his own convenience. Jim definitely doesn’t have the moral high ground in this situation. To make matters worse, the very next day, Captain Barnes announces that Penguin is the Gotham City Police Department’s number one target. Theo Galavan’s plan is rapidly coming together. While the GCPD is pursuing Cobblepot, everyone will be too busy to notice Galavan taking over Gotham from inside the Mayor’s office.